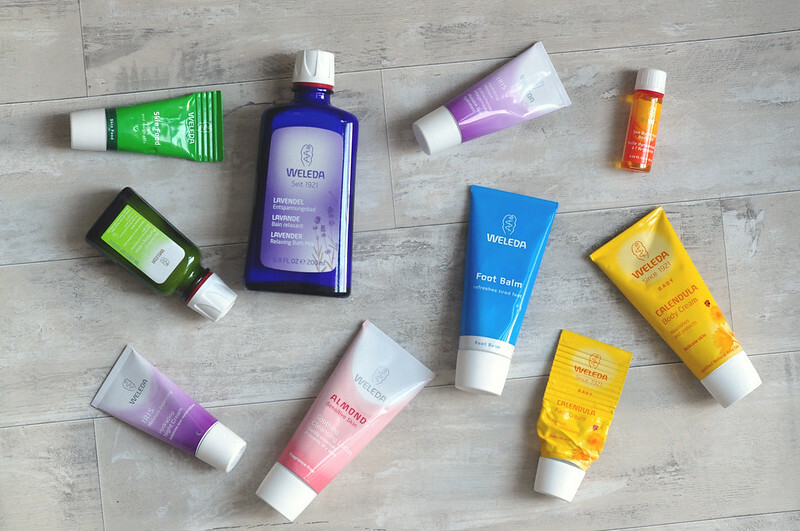 Weleda is a brand that really deserves to be more well-known. I'm so happy to see it getting more exposure in the blogging world, especially over the past couple of months, but it's still a brand I don't hear or read too much about. It's a brand I know I can rely on for products that don't contain synthetic ingredients and one's I know won't irritate my sensitive eczema prone skin. It's one of the few brands that I am constantly repurchasing products from and couldn't be without some of them. Wild Rose Creamy Body Wash | £8.95 // There's a couple of products that I haven't included in the photo as I just don't have them at the moment and this is one of them. The name is right, this is such a creamy moisturising shower gel that smells absolutely amazing. Nearly £9 for a shower gel is quite a lot of money but if you're like me and suffer from eczema then you'll probably be happy to pay a bit more for something that is only doing good things to your skin. This doesn't dry your skin out and also works as a shaving gel as it gives enough slip as well as keeping your skin soft. Weleda doesn't include synthetic fragrances in their products and the scents come from essential oils. Wild Rose Body Lotion | £19.95 // I enjoyed using this body lotion alongside the shower gel to make the rose scent last longer. I did find the glass packaging difficult to use as you had to shake the product out and more often than not too much product came out. This was a nice light moisturiser that sunk in pretty quickly but I didn't fall in love with it like I have others and I haven't repurchased it since. I'd say skip this and try a different Weleda product. Lavender Relaxing Bath Milk | £12.95 // The bottle in the photograph is actually my second and it's not often I repurchase bath products as I like to try something new. Again this is another very moisturising bath product, noticing a theme here? Can you tell I suffer from dry skin? For me, lavender is such a relaxing fragrance so this is one I always use just before bed. A nice relaxing soak with a good book and I know I'll always get a good nights sleep. You don't need to add much of this to your bath, a capful is enough, it emulsifies with the water and turns it milky. Baby Calendula Moisturising Body Cream | £7.95 // Calendula is one of the few ingredients that I know my skin and eczema reacts well to so after really liking the face cream I knew I had to try the body version. I just squeezed out the last of this last night and it'll be part of my empties post at the end of the month. I liked this moisturiser, but I wouldn't rush out and buy it again. It's one I'd get more use out of in the winter when my skin is drier, but at the moment it's a bit too thick. It takes a while to sink in so I tend to use a small amount. When I first bought it I thought I'd finish the tube in a week, but it's lasted a decent amount of time. Foot Balm | £9.95 // Although a newer discovery, this has quickly become one of my favourite products from Weleda. It is incredibly moisturising, but leaves a nice matte feeling to the skin. I've gone through the tube quite quickly, but I will definitely be buying another tube once it's empty. I also find the lavender scent really soothing and just a joy to use despite it being a foot cream. Apply a generous layer and put on a pair of socks before bed and you'll wake up with extremely soft skin. This is something I've tried to get into the habit of doing each night. Almond Soothing Cleansing Lotion | £9.95 // I wanted to love this cleanser, but I'm just not a huge fan of these types of cleansing lotions. I feel like they don't really clean my skin and are also quite hard to remove even with a muslin cloth or flannel. I also wouldn't try using this as a make-up remover and stick with either a micellar water or an oil. I'll use the tube, but I wouldn't repurchase which is a shame. Aknedoron Purifying Lotion | £9.95 // Kate has raved about this product a lot so I knew I had to try it out. This is another one that looks small, but since you only need to use a tiny amount. It's a natural spot treatment and makes a nice change to other products I have. It feels more gentle on my skin, but still effective. Since I do have sensitive skin I make sure I only apply this to the areas of my skin that need it. It has quite a strong pine scent which is nice, just a bit unusual. I gently pat it into the areas that need it and let it sink in after I've cleansed and apply serum and moisturiser as usual. It doesn't dry my skin out which I've had problems with in the past with other spot treatments. It can be used daily or just as and when it's needed. Weleda Iris Moisture Balancing Hydrating Masque | £13.95 // This has quite a strong scent which I'm not sure I really like. This is similar to the Origins hydrating masks and one I reach for when my skin just feels like it needs a drink. It has quite a thin consistency and turns white when you start to apply it. Apply to cleansed skin, leave it on for twenty minutes and then rinse off. The tube is tiny though and after a couple of full face uses it's pretty much empty. Although it seems cheaper than the Origins mask, it doesn't last as long. Baby Calendula Face Cream | £7.95 // Since taking this photo, I've actually finished it and it's on my list to repurchase. This is another one from the baby range so I knew it would be good for my sensitive skin and wouldn't contain any harmful ingredients. I bought it when I was going through a bad stage of having eczema flare ups on my face constantly and no other moisturiser worked, they only irritated it further. This has quite a thick consistency, similar to Skin Food but not as thick, so I'd say this is only really good for those with dry skin and would be too heavy for those with oily skin. Iris Hydrating Night Cream | £13.95 // I haven't quite come to a conclusion on how I feel about this moisturiser yet. It's very moisturising and thick which I don't always mind when it comes to a night cream. The problem I have with it is that when I wake up in the morning I have quite a few white-heads and the only new product I introduced to my routine was this. It might be a little on the heavy side for my skin at the moment and might be better suited to use in the winter. Skin Food | £9.95 // I've been using Skin Food for about four years now and I still love it just as much. I've been through countless tubes over the years and always have it with me either on my bedside table, on my desk or in my handbag. They come in a range of sizes so I keep the full size on my bedside table but am able to carry a mini tube in my handbag. Oat Replenishing Shampoo | £8.95 // I liked this shampoo enough to use a couple of sachets I received with previous orders, but it didn't impress me enough to buy a full size straight away. I'd buy a bottle in the future to try it out properly, but it hasn't wowed me like other shampoos have. Millet Nourishing Shampoo | £8.95 // The same goes for this shampoo! Sea Buckthorn Body Oil | £15.95 // I only had a small bottle of this, but I really liked it. It sunk in quickly and didn't leave my skin feeling greasy. I haven't yet, but I will buy a full size bottle at some point I just haven't decided which one. Birch Cellulite Oil | £19.95 // I don't believe products actually work on cellulite, but I still used and liked this oil. It did nothing to my skin a part from keep it moisturised and the dry patches at bay which is what I expected. I have the purifying lotion and although it stinks, it really does work! I definitely need to try out more from the brand, I've tried a lotion which was really lovely and Skin Food has been a definite favorite, especially for my eczema! I think I'll try a face moisturizer next.